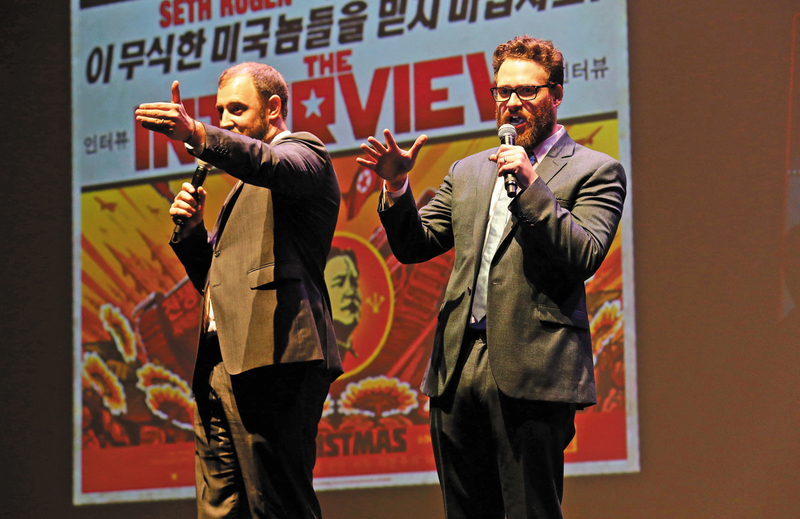 Seth Rogen (right) hawking The Interview at its premiere, December 11, 2014. I was one of the few foreigners living in Pyongyang when Kim Jong-il died in December of 2011. Recently, in the days following the third anniversary of his death, I watched the fictitious assassination of his son, Kim Jong-un, in The Interview. After the Sony hack saga, the film was pulled, then released at a limited number of theaters and online, setting a record as Sony’s highest grossing online release. Although North Korea denied involvement, the FBI immediately accused the regime of being the hackers known as “Guardians of Peace,” a claim that many security experts noted was backed by scant evidence. Consequently, the United States levied some additional sanctions against the country. Without the government’s making public the evidence that North Korea is indeed the culprit, are these sanctions justified? The film itself isn’t worth an international uproar. It’s a raunchy comedy with some mildly funny bits at the expense of Asians, gays, Jews and women. It belongs in the all too familiar terrain of two dudes’ “excellent” adventure, like Bill and Ted or Dumb and Dumber, with North Korea as an incidental backdrop. The makers of the film got some details right, such as North Korea’s history of manipulating the media and presenting Pyongyang as a Potemkin capital. But there are also some eyesores as well, such as the oddly pan-Asian songs that sound nothing like North Korean or the awkwardly spoken, heavily American-accented Korean, especially from the actor playing Kim Jong-un. But it’s a comedy, not a documentary, so accuracy isn’t expected. The Interview, however, is more about America than it is about North Korea, both in its content and as an event. Despite what some critics have claimed, the film is no political satire. It’s popular entertainment that perpetuates America’s myth of itself as the real guardian of global peace. It sells a hackneyed tale of the two white American heroes killing the evil dictator and saving North Korea, the country the United States is responsible for creating in 1945, a fact not mentioned in the film. Ironically, it is another pair of American males, the US officials Charles Bonesteel and Dean Rusk, who arbitrarily drew up the 38th Parallel that still separates 70 million Koreans. The film also contains one of the only commercial depictions, comedy or not, of a sitting president of another nation being killed on screen. The cartoon-like way Kim Jong-un gets blown to pieces betrays the dehumanizing manner in which Americans view North Koreans. Laughter has a power to heal travesty, but here it is a tool for bullying; the most powerful country in the world entertains itself at the expense of one of the poorest and most devastated. Ultimately, the film—from its production, cancellation and eventual release—is the result of a set of financial decisions by Sony and the film’s investors. The fact that it was green-lighted and offered for public consumption is a testament to how isolated North Korea really is, with almost no vested interests from the Western financial sector. It’s also a sign of how capitalistic and unconscionable the American film industry is, with its vulgar choice to exploit a gulag nation for a quick buck (Sony Pictures is an American subsidiary of the Japanese parent company). What is mystifying, however, is why the Sony hack has so quickly escalated to the grave political decision of imposing new sanctions. When it comes to dealing with North Korea, there is no system of verification, and this lack of transparency inevitably invites exploitation. Just as North Korea, whether guilty or not, can benefit from now being feared as a cyber threat, the United States could also take the matter into its own hands. There is something mildly “shock and awe” about the speed with which the United States swiftly pointed a finger and punished the presumed culprit, as if to set an example to all future hackers who might threaten American interests. As if to ward off further criticism, FBI director James Comey, in conjunction with NSA, claimed that the hackers’ activities traced back to North Korean IP addresses, but the actual evidence itself was not made public. Comey has called for the declassification of this and other information related to the hack. But even without that information, some senators have called for the State Department to add North Korea back to its list of nations that sponsor terrorism, even though President Obama called the Sony hack a case of cyber-vandalism, not terrorism. The toughened sanctions have led North Korea to swear retaliation, which suggests a nuclear threat and now possibly also a cyber-threat. The American policy towards North Korea is a set of repeating variables; after all, North Korea had been on that black list from 1988 until 2008, and their renewed threats strike a tone of déjà vu. In this case, reality does not mimic Hollywood movies—no American hero is about to rescue the devastated citizens of North Korea anytime soon. Suki KimTwitterSuki Kim is the author of Without You, There Is No Us: My Time with the Sons of North Korea’s Elite (Crown, 2014).